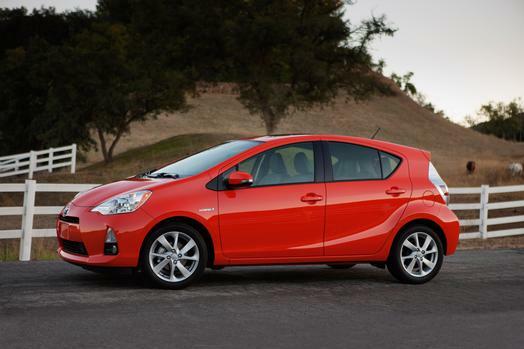 The new Toyota Prius C is what most folks think of when they imagine a hybrid car. They think of an extremely small car that gets great gas mileage, but has a hard time getting out of its own way. 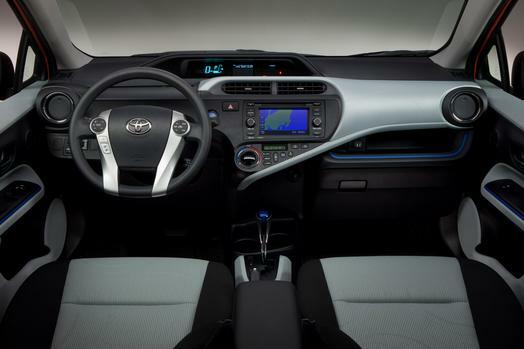 But unlike many hybrids, the original Prius’s smaller cousin also comes with a smaller, more entry-level price, the base C One starting at $18,950 and the tested C Two starting at $19,900. That’s about $4,000 less than many hybrids, including the Prius II that is about 19 inches longer too. The C looks more like a Honda Fit, which is to say it’s sort of pointy-nosed cute with a lot of glass and bathed in a bright red paint job, the test car looked fun and spritely. Certainly its handling is light and accurate enough to be rated spritely, but its power, its acceleration skews toward methodical. And that’s after Prius C dropped about 500 lbs. from that of the original hybrid. Mainly you’ll feel like a slow-moving target at stoplights as you press on the accelerator and the tiny 1.5-liter 4-cylinder engine kicks in after a short burst of electric power from the batteries power you up to about 20 mph. This is where you are saving gas. After that the little engine growls viciously as it tries to nudge the 2,600-lb. car up to cruising speeds. Combined, the electric and gas power, deliver but 99 horses. I also found myself waiting much longer to cross traffic or turn against oncoming traffic, gauging that I’d need much more space to get the car across the road than with a normal gas-powered vehicle. In addition to its shortage of oomph, the C uses an electronic continuously variable transmission (ECVT), which does the car no favors. While it delivers smooth power, as CVTs generally do, the transmission offers little low-end giddy-up. While performance is lax, the gas mileage this version of the Prius achieves is laudatory. I got 48.2 mpg, while the trip computer indicated 50.7 mpg. The EPA rates this car at 53 mpg city and 46 mpg highway. 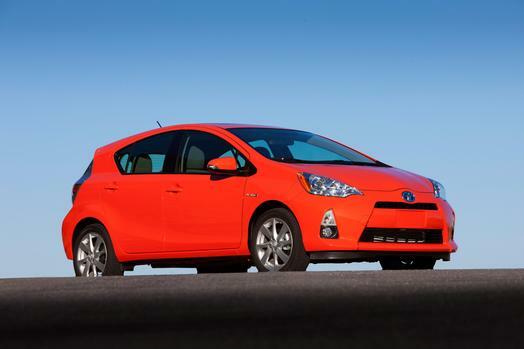 The larger original Prius is rated 51 and 48 mpg. The C also rides on small tires, 15-inchers, and there is the typical small car jiggle and suspension thump on rough roads. Rarely is it uncomfortable, but you know you’re riding in a small car. On the C Three and Four 16-inch tires are standard, but those also start at $21,635 and $23,230, respectively. Braking is fine and there is ABS and traction control, although I’d challenge anyone to squeal the tires on the C.
Inside, the car has a cheap plastic feel to all its surfaces and it looks low-cost. The test car had a gray and black cloth interior with gray plastic atop the doors and on part of the dash. Everything feels hard and inexpensive. Even the wheel feels bargain basement like a kid’s plastic baseball bat, its only benefit being a flat bottom that allows the driver to easily fit his or her legs under the wheel, even if the driver’s seat is well forward. The wheel also is tilt/telescope and has radio, phone and trip computer buttons on its hub, along with buttons to change the cabin temperature. Naturally the interior is very quiet at low speeds when the electric motor is doing its job, but the engine gets buzzy under heavy acceleration. Yet visibility is quite good all around as this is a glassy cockpit. I also like the dash layout and ease of seeing the key gauges. But there are 8 screen choices for the main dash gauges, all telling you what a great job of fuel saving you’re doing at the moment, or over time. That’s about 6 too many. I mean do you really need to know your average speed on a tank of gas or what you averaged on the last three short drives you took? I think not. Seating is firm with slight contouring and the front seats are manually adjusted. Back seats are pretty hard. But I will credit the Prius with having six radio channel selection buttons and a radio even I could figure out. Many luxury make aren’t that considerate. The car also has two small radio knobs, another spot where Toyota saved an ounce or two I guess to help fuel economy, but not help the driver use this radio. That’s ironic, because the knobs to control the air temperature are huge with small buttons to adjust the rest of the system. I do like that the key here acts as a remote fob, with lock and unlock buttons on its base. 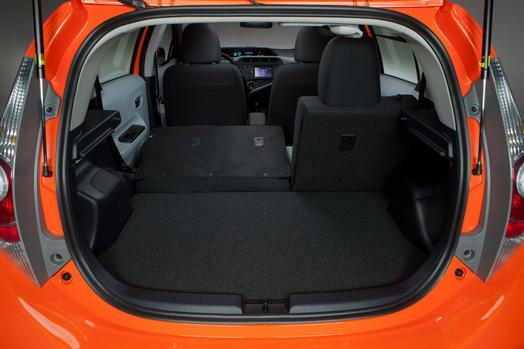 Prius C also will carry four people, although headroom is limited in the rear seat. Note though, that the extra weight makes acceleration that much more challenging. Likewise, there is a huge 17.0 cubic foot cargo area. That’s great for groceries, but again adding weight slows the C.
Finally, my pet peeve, the thin overhead visors do not have extenders and do not slide to help block side sun. One or the other should be standard, just for safety in winter when the sun is at a lower angle. With only a $760 delivery charge the red test car came in at $20,660. That makes this pretty reasonably priced and with low fuel consumption this is economical to run, about $10-15 a week for gas. But you give up a lot of performance vs. a gas-powered compact or subcompact car. Certainly the C’s gas consumption, or lack thereof, earns this Prius a few bonus points. But it needs those to hit an average grade of C. Maybe that’s how it got its name! 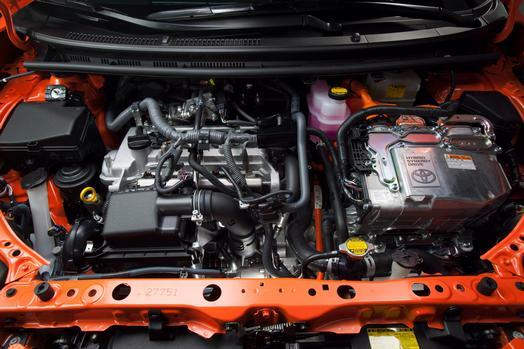 Under the hood you see the tiny gas engine and electric motor that help power the downsized Prius C.
Hits: Great gas mileage, quiet running, excellent visibility, light & good handling, will seat four, key acts as fob and steering wheel has flat bottom. Misses: Low on power, dash and trim exudes cheap plastic feel, visors don’t slide and acceleration means you wait longer for big openings in traffic. naturally like your web-site but you have to test the spelling on several of your posts. Several of them are rife with spelling issues and I find it very troublesome to inform the truth then again I’ll definitely come back again. Hi. Thanks so much. We’ll work on the grammar. Thanks for promising to come back. Have a great Christmas. Like the snow falling on the site?